By Chris Williams: Michael Koncz, the trusted personal advisor to WBO welterweight champion Manny Pacquiao, is saying that Pacquiao has agreed to fight WBC Floyd Mayweather Jr., but with a couple of conditions: 1.) the fight has to take place at the end of May rather than on May 5th the date that Mayweather wants it to take place. 2.) The fight must be fought in a larger arena than the MGM Grand. Pacquiao reportedly approved the message that Koncz sent. The outdoor stadium will be put together to hold between 45,000 to 50,000 fans. Arum believes that an extra $20 million can be squeezed out from the larger outdoor arena. The MGM Grand has a seating capacity of 16,800 fans and if Arum can have a 50,000 seat stadium built on the cheap, then they could triple the earnings from ticket sales. That sounds like a good idea. I would go along with that if I were Mayweather. 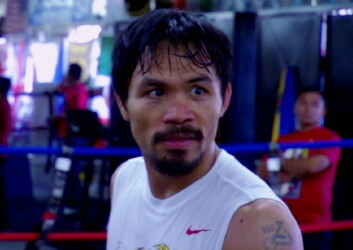 « Pacquiao says his cut is fine: Does Arum know that?